Know what I love about transcontinental flights? The movies. It is there, hurtling through space, miles above the earth, that I get to indulge in the sort of mindless cinematic pap I'd normally consider myself too discerning to stoop to watching at home. Eleven hours in coach has broken many a stronger man than I. This is my excuse for willingly viewing "My Life in Ruins", the latest Nia Vardalos vehicle. I watched each of the 95 cliche-laden minutes of stale jokes, makeovers, and bizarre costume choices. It was so bad that when Rita Wilson showed up as the ghost-wife of Richard Dreyfuss (see what I mean?) I cringed for her, like you would if you saw Michelle Obama in a Mentos commercial. I mean, Rita Wilson, for chrissakes. 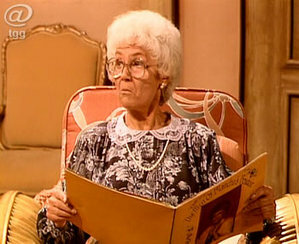 Like she's some paragon of acting ability, some grande dame of the screen. Anyway. It was worth it. Watching the movie, I mean. Here's why. Anyway, follow me to last week, one week after returning home from Bunni's first trip abroad. She was jet lagged, poor thing. I was jet lagged. Dad was jet lagged when - fun! - after six months of bouncing Bunni to sleep on the yoga ball, sciatica clamped down on him harder than a pit bull's jaw. When I say "fun!" I am obviously lying. We're talking incapacitated dad, here. Can't sit, can't bend, can't lay down, certainly can't pick up baby, because of excruciating pain. Fun! So on top of being the sole caregiver during the day, Bunni's jet lag-induced hourly waking became my solo responsibility, too. All night long - sing it with me, Lionel - all night. Needless to say, day after day of this routine sucked away any ounce of joy that may have ever been hidden in my marrow. By Thursday I was at my wit's end. Exhausted. Cranky. Depressed. Martyr-iffic. Full of self-pity and utterly lacking any charity for my pain-wracked husband. During one of his many trips that week to the chiropractor I plunged dangerously close to my personal nadir. Lemme tell ya, its freaking UGLY down there. I had the tv on for company. Despite my usual commitment to keeping it off while my daughter is awake I had inexplicably tuned in to the PBS telethon. Dr. Wayne Dyer was blabbing on about "making changes". Seriously, it was all I could do to keep from hurling the television onto the sidewalk outside and using the shards of glass to slit my wrists (fatigue makes me a little dramatic). When suddenly he said something useful: "Buddhists say that your future is created right now - by your thoughts. Change your thoughts and you can change your future", or some such irritating psychobabble nonsense to that effect. So I decided I'd - just for an experiment, mind you - try this out. I hit pause on the "I'm tired I hate sciatica I'm tired I hate him for having sciatica" stream. And my mind went to My Big Fat Greek Sequel. Nia, playing an uptight Greek-American, is fed up by how Greek people are running their islands. The tvs don't work. The beds are uncomfortable. The elevators break down. Its hot. "And what do they do about all of this?" she asks in annoying narrator overdub. "They dance. Just like when Anthony Quinn loses his life's savings in Zorba the Greek. They dance." You can tell she just doesn't understand! those zany Greeks. Why don't they just call a repair person? Who dances? But maybe those zany Greeks are on to something, I thought. If it's good enough for the cradle of civilization, its probably good enough for me. Dancing has to be more fun than being an uptight American. Or a bitter stay-at-home mom. 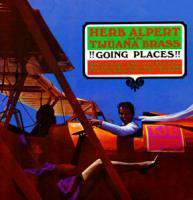 So I hauled out one of my favorite albums of all time: Herb Alpert and the Tijuana Brass's Going Places. Dropped the needle on their version of Zorba the Greek. Danced Bunni around the living room, sending her into squeals of delight with my snapping fingers, our dips and twirls. And you know what? It worked. You hear that, Dr. Wayne Dyer? Plato? Rita Wilson? I felt better. Maybe not coconut-margarita-and-a-three-hour-nap good. But better. how brilliant this post is. way to wrap wayne dyer, nia whatshername and annoying sciatica all into a witty, tour de force of good that gave me my new favorite word. matyr-iffic. glad y'all are back and feeling better. good ol' herb alpert.